You can use artificial greens or any kind of filler for the base of the arrangement. I used fresh Fraser fir clippings (free from a local Christmas tree vendor). Note: if you want to use fresh greenery, you'll want to periodically spritz the greens with water or line the bowl with plastic and tuck the greens into water-soaked floral foam to keep them fresh. Super easy! There so many variations of colors and looks that you can use so keep a lookout for those dough bowls! You are an amazing decorator!! I LOVE everything you do!! LOVED your Christmas Living Room and this is just stunning!! Gorgeous!! Love it. Just beautiful. Can't wait to see more pics of your Christmas decor. Hi Kristen, Everything looks lovely! 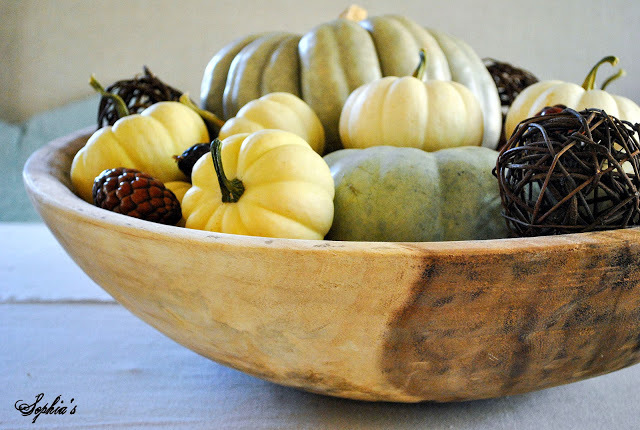 I would love to find a round dough bowl one of these days, they look so good with greens in them. Can you believe I passed by a dough bowl at Brimfield - yes, I'm still kicking myself! Gorgeous display! Beautiful, beautiful Kristen...so envious that you are done with your decorating...I have many more days of it! !..Love the new dough bowl and looking forward to seeing what you are doing with the large "canoe" bowl! !...I am certain it will be magnificent!!!.. This is such abeautiufl display! Love all the greens and the way the ornaments are place around.